The Ahnapee River Watershed is located in northeastern Kewaunee County and south central Door County and is 86,772 acres in size. It contains 189 miles of streams and rivers, 5,768 acres of lakes and 15,037 acres of wetlands. The watershed is dominated by agriculture (71%) and wetlands (17%) and is ranked high for nonpoint source issues affecting streams and groundwater. The Ahnapee River Watershed is part of two ecological landscapes. The Central Lake Michigan Coastal landscape is found in the southern two-thirds of the watershed and the Northern Lake Michigan Coastal landscape is found in the northern third. The Central Lake Michigan Coastal Ecological Landscape stretches from southern Door County west across Green Bay to the Wolf River drainage, then southward in a narrowing strip along the Lake Michigan shore to central Milwaukee County. Owing to the influence of Lake Michigan in the eastern part of this landscape, summers there are cooler, winters warmer, and precipitation levels greater than at locations farther inland. Dolomites and shales underlie the glacial deposits that blanket virtually all of the Central Lake Michigan Coastal Ecological Landscape. The dolomite Niagara Escarpment is the major bedrock feature, running across the entire landscape from northeast to southwest. Series of dolomite cliffs provide critical habitat for rare terrestrial snails, bats, and specialized plants. The primary glacial landforms are ground moraine, outwash, and lakeplain. The topography is generally rolling where the surface is underlain by ground moraine, variable over areas of outwash, and nearly level where lacustrine deposits are present. Important soils include clays, loams, sands, and gravels. Certain landforms, such as sand spits, clay bluffs, beach and dune complexes, and ridge and swale systems, are associated only with the shorelines of Lake Michigan and Green Bay. Historically, most of this landscape was vegetated with mesic hardwood forest composed primarily of sugar maple, basswood, and beech. Hemlock and white pine were locally important, but hemlock was generally restricted to cool moist sites near Lake Michigan. Areas of poorly drained glacial lakeplain supported wet forests of tamarack, white cedar, black ash, red maple, and elm, while the Wolf and Embarrass Rivers flowed through extensive floodplain forests of silver maple, green ash, and swamp white oak. Emergent marshes and wet meadows were common in and adjacent to lower Green Bay, while Lake Michigan shoreline areas featured beaches, dunes, interdunal wetlands, marshes, and highly diverse ridge and swale vegetation. Small patches of prairie and oak savanna were present in the southwestern portion of this landscape. The Northern Lake Michigan Coastal Ecological Landscape is located in northeastern Wisconsin, and includes Green Bay and the northern part of the Door Peninsula. Its landforms consist of the Niagara escarpment, a prominent dolomite outcropping along the east side of Green Bay, a lacustrine plain along the west side of Green Bay, and ground moraine elsewhere. Low sand dunes and beach ridges that support Great Lakes endemics and many other rare species are found along the Great Lakes shoreline. The influence of Lake Michigan moderates extreme temperatures. Soils are very diverse; in some areas, lacustrine sands are found overlying clays or bedrock within only a few feet of the surface. In the Door Peninsula, soils are typically stony loamy sands to loams. Poorly drained sands are common in the lake plain or in depressions between dunes and beach ridges. On the western side of Green Bay, the ground moraine is composed mostly of moderately well drained, rocky sandy loams, interspersed with lacustrine sands and clays, and peat and muck also common. Historic vegetation included maple-basswood-beech forest, hemlock-hardwood forest, northern white cedar swamp, hardwood-conifer swamp, wet meadows, and coastal marshes. Conifer dominated upland forests that resemble the boreal forest were present along Lake Michigan; they contain a significant component of white spruce and balsam fir. Cliffs, sinkholes, and dolomite ledges are associated with the Niagara Escarpment. Current vegetation consists of more than 60% non-forested land, most of which is in agricultural crops, with smaller amounts of grassland, wetland, shrubland, and urbanized areas. Forested lands are dominated by maple-basswood, with smaller amounts of lowland hardwoods, aspen-birch, and lowland conifers. High quality areas of exposed alkaline bedrock beach occur on the northern Door Peninsula, providing habitat for many rare plants. Several islands lie off the Door Peninsula and these also provide critical habitat for rare species and colonially nesting birds. 2016 Total Phosphorus Monitoring Report - Mashek Creek - Mashek Cr. Lakeshore Dr.
East Alaska Lake Alum Treatment-One Year Post-treatment 2012 Update. Tri-Lakes Assn. : Tri Lakes Prevention & Control Project: The Tri Lakes Assn proposes to control Eurasian Water-Milfoil (EWM) and Curly Leaf Pondweed (CLP) in Krohn's, East Alaska and West Alaska Lakes by implementing control measures during the period 2008. The project elements and deliverables are specified in the Tri Lake Assn's AIS Control Grant application dated January 10, 2008. The project includes conducting pre- and post-treatment surveys and monitoring, and mapping the extent of EWM and CLP; controlling EWM and CLP with aquatic herbicide treatments; implementing an AIS prevention strategy that includes developing an awareness & an education program, and conducting watercraft inspection. A final report summarizing the one-year project will be provided to DNR. Watercraft inspection records will be entered into the State's online Watercraft Inspection Database. If a consultant is to provide the final report, it is recommended that the grantee provide the DNR AIS Coordinator with a draft for comment on report adequacy prior to making final payment to the consultant. DNR will be provided both paper and electronic .pdf copies of the final report along with, or prior to, submission of grantee's final payment request. Town Of Pierce: West/East Alaska Exotic Species Study: The Town of Pierce, on behalf of the Tri-Lakes Association, proposes to conduct aquatic invasives species monitoring activities in 2007. The project elements and deliverables are specified in the Town of Pierce Aquatic Invasive Species Control Grant application, dated January 30, 2007. The project includes conducting aquatic invasive species (AIS) surveys in East Alaska Lake, West Alaska Lake and Krohns Lake; and mapping the location and estimating abundance of AIS using a GPS system. A final report summarizing the project will be provided to DNR. If consultant is to provide the final report, it is recommended the Grantee provide the DNR Aquatic Invasive Species Coordinator with a draft for comment on report adequacy prior to making final payment to the consultant. DNR to receive both paper and electronic .pdf copies of the final report along with, or prior to, submission of grantee's final payment request. Tri-Lakes Assn. : Lmi-East Alaska Lake Alum Treatment: Tri-Lakes Association,Inc. will conduct an alum treatment on East AlaskaLake in Kewaunee County and monitor water quality. Specifically, Tri-Lakes Association will contract with a chemical applicator to apply alum following their approved alum treatment plan, provide public notice of the treatment specifying treatment date, monitor water quality on East Alaska Lake pre, during, and post treatment and complete a report comparing water quality pre and post treatment. The project elements and deliverables are specified in the grant application material submitted to the Department dated May 1, 2011. Door County: Forestville Mill Pond Comprehensive Lake Management Plan: Door County Soil and Water Conservation Department is sponsoring a project to update the Forestville Millpond Lake Management plan. Project final deliverables include: all data collected, agendas and minutes for planning meetings, and a river management plan that includes methodologies, results, and management alternatives discussion with an implementation plan. Specific project activities include: 1) Inventory livestock operations, cropland practices, point and nonpoint sources of pollution and model pollutant loading in the watershed; 2) quantify and classify accumulated sediment deposits in the lake by conducting a bathymetric survey and sampling sediment cores in the millpond; 3) Monitor water quality of the Ahnapee River upstream of the millpond and in the millpond; 4) Incorporate fisheries data within the management plan; 5) Assessment of the current aquatic plant community; 6) Completion of stakeholders survey; 7) Public participation in the planning process; 8) Creation of an updated comprehensive lake management plan that includes an implementation strategy. Special Conditions: 1) Draft sociological/user survey must be reviewed and approved by the Department before being initiated. Town Of Pierce: East Alaska Lake Management Project: The Town of Pierce proposes to conduct a baseline characterization of the East Alaska Lake while identifying lake management issues and needs. To meet this objective, the lake study will include delineation of watershed drainage basins and corridors, digital elevation modeling, identification of existing land uses in the Lake watershed, examination of the impacts of existing land uses on water quality, water quality monitoring, and an aquatic vegetation survey." Tri-Lakes Assn. : E. Alaska Lake Alum Feasibility Study Phase 1: The Tri-Lakes Association proposes to complete a feasibility study concerning the recommended alum treatment of East Alaska Lake. The study will be completed in two concurrent phases. Phase 1 will determine the phosphorus loads entering the lake from two point sources. Phase 2 will assess the extent of internal phosphorus loading and develop a hydrologic budget for the lake. Copies of the combined report detailing the activities and findings of both the phase 1 and phase 2 projects will be supplied to the Department of Natural Resources, the Tri-Lakes Association, and the Kewaunee County Land and Water Conservation Department upon completion. The results will also be presented to the Tri-Lakes Association and other interested individuals. Tri-Lakes Assn. : E. Alaska Lake Alum Feasibility Study Phase 2: The Tri-Lakes Association proposes to complete a feasibility study concerning the recommended alum treatment of East Alaska Lake. The study will be completed in two concurrent phases. Phase 1 will determine the phosphorus loads entering the lake from two point sources. Phase 2 will assess the extent of internal phosphorus loading and develop a hydrologic budget for the lake. Copies of the combined report detailing the activities and findings of both the phase 1 and phase 2 projects will be supplied to the Department of Natural Resources, the Tri-Lakes Association, and the Kewaunee County Land and Water Conservation Department upon completion. The results will also be presented to the Tri-Lakes Association and other interested individuals. Tri-Lakes Assn. : East Alaska Lake Alum Planning Project: The Tri Lakes Assn proposes to\201CDevelop a plan for Alum Treatment of East Alaska Lake\201D This will enable P reduction for the lakes water quality and potentially funding for actual alum treatments i.e. implementation. This project will complete an Implementation Plan for Alum treatment and serve as an addendum to the lake plan created in 1999. Background material along with 10 copies of the \201Cplan\201D will be provided to the state and sponsor. If a consultant is to provide the final report, it is recommended that the Grantee provide the Department Lake Coordinator with a draft for comment on report adequacy prior to making final payment to the consultant. The Department shall receive both paper and electronic PDF copies of the final report along with, or prior to submission of the grantee's final payment request. Door County Airport & Parks Department: Forestville Millpond Management Planning: Conduct water quality sampling. Conduct sampling of pond sediment for heavy metals and pesticides. Conduct an inventory of the watershed. Items to be included are listed in the Project Description, attached to the application. Prepare a final reportthat includes the results of Tasks 1 - 3 listed above. Information will be disseminated to the public by newsletter, local newspaper articles and public meetings. Project results will be reposited at Door County Airport and Parks Department and the DoorCounty Soil and Water Conservation Department. Tri-Lakes Assn. 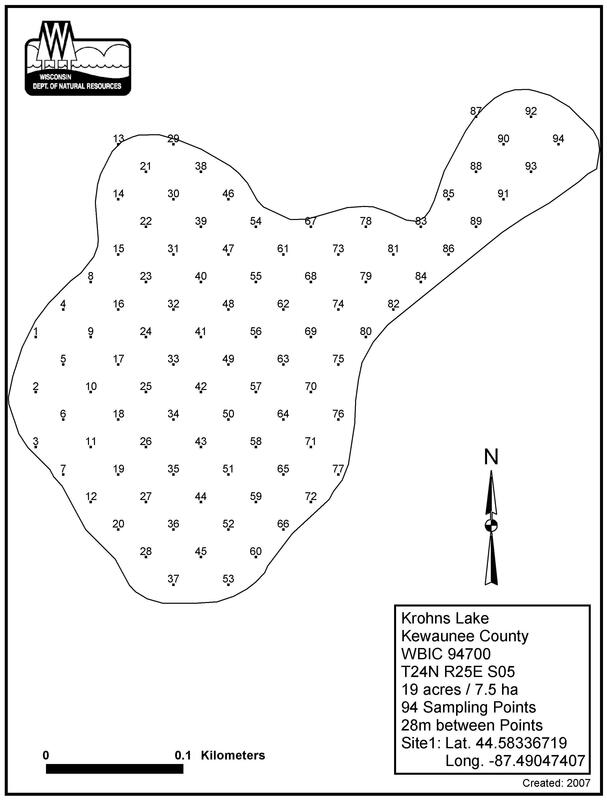 : Krohn'S Lake Baseline Diagnostic Study: The Tri Lakes Association proposes to conduct a baseline study and develop a comprehensive lake management plan for Krohns Lake. Specifically, the project will delineate the lake's watershed and existing land uses, estimate nutrient and sediment runoff from various land uses including the public parking area, collect baseline water quality conditions, conduct an aquatic plant survey, evaluate the potential for nutrient loading from residential septic systems, and develop a comprehensive lake management plan for Krohns Lake. The Tri Lakes Association and the Department of Natural Resources will be provided with hard copies and electronic copies of the study results and final lake management plan. Additional copies will be provided to the local library and the Kewaunee County Promotion and Recreation Department. Tri-Lakes Assn. : W. Alaska Lake Baseline Diagnostic Study: The Tri Lakes Association proposes to conduct a baseline study and develop a comprehensive lake management plan for West Alaska Lake. Specifically, the project will delineate the lake's watershed and existing land uses, estimate nutrient and sediment runoff from various land uses, collect baseline water quality conditions, conduct an aquatic plant survey, evaluate the potential for nutrient loading from residential septic systems, and develop a comprehensive lake management plan for West Alaska Lake. Lakeshore Natural Resources Partnership Inc.: Lakeshore Nr Partnership Capacity Building & Business Plan Development & Implementation: The Lakeshore Natural Resources Partnership, Inc. proposes to carry out the goals of its strategic plan by obtaining technical assistance in establishing and implementing a business plan and obtaining equipment necessary for successful communication. The project elements and deliverables will be completed as described in the project proposal submitted to the Department and dated April 29, 2005. Basin should initiate a self-help lake monitoring effort on West Alaska Lake. Basin staff should conduct basin assessment monitoring on streams in the Ahnapee River watershed (TK04) so the watershed can be reevaluated for nonpoint source priorities. Assessment monitoring should include stream habitat surveys (Simonson et al., 1993) to help identify stream segments that are degraded because of the lack of adequate buffers and vegetative filter strips. This information will help guide CREP, the Targeted Runoff Managament (TRM) Program, and other conservation funding programs to the areas of greatest need. Category 3. 2018 TP Results: May Exceed. Station: 10011676. AU: 10208. Basin personnel should assess the impact of golf course runoff on East Alaska Lake (TK04). Volunteer monitoring of TP and TSS on the Ahnapee River. The Ahnapee River Watershed is home to the Ahnapee State Trail which runs from Sturgeon Bay in the north, to Algoma in the south, then west to Casco for a total distance of 28.6 mi. The trail is named for the Ahnapee River, which parallels the route for about five miles between Forestville and Algoma. Ahnapee means "when?" in Ojibwa. A portion of the trail near Forestville passes through an area burned by the Great Peshtigo Fire of 1871. The most devastating forest fire in American history destroyed more than 1.25 million acres and killed at least 1,152 people. The fire occurred at the same time of the Great Chicago Fire and was overshadowed by it, even though the Peshtigo fire was larger and deadlier. The trail started out as tracks for the Ahnapee & Western Railroad, which served as an industrial link for Door, Brown, and Kewaunee Counties. It had major destinations in Algoma, Sturgeon Bay and Casco Junction. Steam and diesel powered locomotives journeyed through Wisconsin hauling lumber, dairy products, and other commodities. In the early 1970's, costs and alternative routes of shipping forced the Ahnapee and Western to abandon the line. The State of Wisconsin opened the cleared railway as a recreation trail for bicyclists, horseback riders, hikers and snowmobilers in 1975.